The Red Jeep Saga Continues…. Sunday I drove the red Jeep to my mom’s for Mother’s Day. On the way there I decided to stop to get her a card. I stopped at a Dollar Store near her house. When I got back to the Jeep, it turned over slowly at first and then not at all. I did not have any tools or even jumper cables with me. So, I called my Dad to come rescue me. When he got there, we connected the jumper cables but it made no difference. The starter would not turn at all. I tried the old trick of whacking it with a big wrench, but it would only give a partial turn before it stopped again. This being a starter that had failed before, I was not entirely surprised. So we pushed the Jeep to across the parking lot away form the door and headed over to steal the starter from Scott’s Jeep that he has conveniently stored at Dad’s garage. We took the battery along to charge it just in case as well. 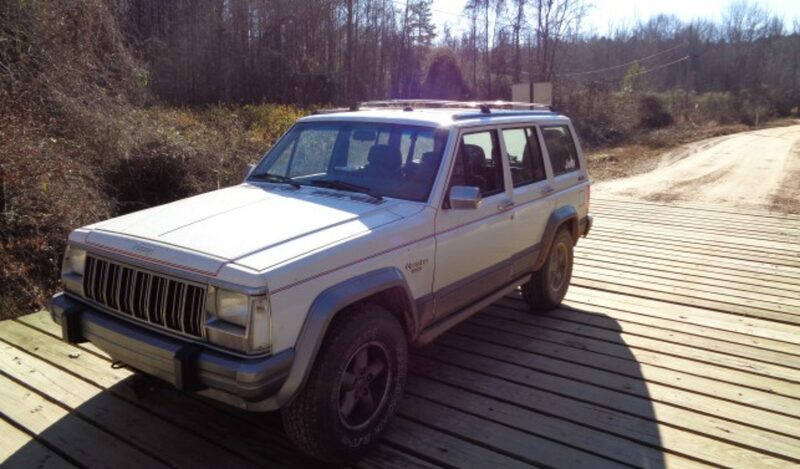 Having recently written and article on how to change a Jeep starter I was able to very quickly pull the starter of Scott’s XJ Wagoneer and head back to the Dollar General Store parking lot. Back at the store, I swapped in the other starter while Dad reinstalled the battery above me. It all went very smoothly and quickly. There is plenty of room to work under the Jeep without even having to jack it up. And these are both stock height. As Dad connected the battery cables, I hit the key. Nothing! We both looked at each other kinda stunned. We had even tested the other starter after taking it off Scott’s Jeep. I found the one jumper that I had left in the console and began to trouble shoot the starter circuit in my head. My plan was to bypass the starter relay and see what happened. When I reached down to to pull the trigger wire off the relay so I could jump it, I saw it was already loose. It had gotten knocked off when the battery was removed or replaced. I reconnected the green wire and tried the key again. This time it spun over like it should. We both commented that the engine sounded like it slowed down when it cranked. After Dad and I cleaned up, I gave Mom her card and sat down and had a nice chat with them. Since we have been playing with old cars and Jeeps for a long time, these adventures don’t really surprise us anymore. Previous PostPrevious Life in a haunted house.